I went out to dinner with my buddy Levi the other night and it turned out that I brought a proverbial knife to a gunfight. It was a "soft" opening for a new Thai restaurant downtown in the old Cru space. Thai food for the western palate. I figured that I'd bring something tasty that would go with the food, we'd have a few glasses and enjoy our meal, nothing terribly fancy. It turned out to be one of those nights where everything you drink is noble, old, and glorious. As we sat down I took out the wine I brought along, the 2008 Pierre Gonon St Joseph Blanc Les Oliviers, $32, Fruit of the Vines Imports. But that bottle waited in the corner of the table, as a magnum of 1996 Bollinger Grande Année appeared. So that's how it's going to be. I was surprised by how open and utterly drinkable the wine was, as you hear about how acidic and closed down the 1996's can be. Not this one - it was generous and just lovely, very much a wine of finesse. The finish was delicate and intense, with this kernel of floral fragrance that left a great impression. I don't know how long this bottle had been open - perhaps it was shut tight 6 hours prior to me drinking a glass, but in any case, certainly a compelling case for 1996 Bollinger. 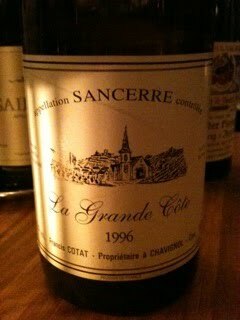 Then Levi pulls out a 1996 Francis Cotat Sancerre La Grande Côte, Michael Skurnik Imports. Yes, Francis, not his son François (I think it's his son, anyway). This is a phenomenal wine, and one of the interesting things about it is that honestly, served blind, there would be no way to peg it as Sauvignon Blanc. We agreed that it smelled, tasted, and really felt like Chenin Blanc - an old Montlouis, Levi said. In any case, it is beautifully and energetically aromatic, perfectly balanced, rich with baked apples, and it expanded and changed quite a bit over the course of an hour. A great argument for cellaring high quality Sancerre. If my night had ended there, I would have had plenty of wine to think about. But Levi works most nights and doesn't himself get to go out to dinner very often. 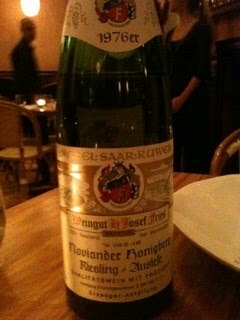 So he couldn't stop himself from bringing along a bottle of old Riesling, the 1976 H. Josef Fries Noviander Honigberg Riesling Auslese, Savio Soares Selections. The first surprise about this wine - it was very fresh and vigorous. The wine is 34 years old. One of the very kind servers appeared with a wine by the same producer, but from the 1992 vintage, "just to compare," he said. That wine was also delicious, and it seemed like a newborn baby in the company of the golden rich 34 year old wine. In the 1976 there was a little petrol hint, but for me the overall sensation of the wine was this slow-creeping herbal honey over rocks. It drank dry, by the way, and I didn't know it was an Auslese until I looked more carefully at the label. By the way, as I was putting my coat on to leave, the Gonon St Joseph had finally opened up and was a delicious blend of flowers, white fruit, and stones. If you happen to have any of this, seems like it's worth leaving it alone for a few years, at least. That should be enough, and I should be winding up this post up, but Levi suggested as we were leaving that we go to Babbo, just to drink this wine he had been wanting to drink for 6 months, a wine that no one else sells. And so we did. 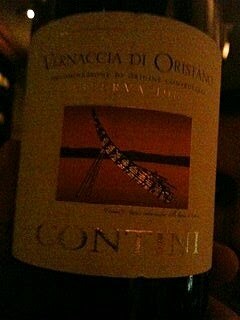 It is a solera wine from Sardinia, the 1987 Attilio Contini Vernaccia di Oristano Riserva. This is the kind of wine that really makes you wonder about things. Why solera wine, in Sardinia? How does it taste at the same time like Manzanilla sherry and also like the orange bitters and spice of Chinato? Does 1987 refer to the youngest wine in this bottle? Will I ever feel as though I actually know anything about wine? Probably not. I've never before tasted anything like this wine. I guess it's considered to be a dessert wine, but I cannot imagine drinking it with sweet food. Certain cheeses, maybe, like something hard and salty made of sheep's milk. I would love to drink it again as the focus of an evening, but apparently there really isn't any more of it to be had in these parts. I often dream about moving with my wife and small kids out of New York to some smaller and more manageable place. This kind of evening, though, reminds me of how amazing it is to be here in that without expecting it, you can experience several different esoteric and beautiful things from all over the world, with friends, in one night. Peter Liem on "The Variability of Experience." This week's World of Fine Wine blog post is by Peter Liem, and you are cheating yourself if you don't take 10 minutes to read it and think about it. Generally speaking, we don't deal well with the issue of variability in wine. We like things to be definitively laid out in black and white-we want to be able to know that a wine tastes a certain way, and have some guarantee that it fulfills the promise of its label when we open it. This, too, is how we discuss it with others: in the language and the systems that we have developed to talk about wine, we often create a false sense of precision, attempting to codify experience in a way that it is naturally resistant to. Get on over there and read the rest of the article on your own. You will have a better day if you do. It had just become evening, time to stop working, time to get dinner ready for the kids, time to have a glass of wine. I opened the door to the wine fridge and started rummaging around - I was looking for Muscadet, Marc Ollivier's 2009 Clos des Briords, to be exact. And then I saw something I wasn't expecting to see, a bottle of 2009 Schloss Gobelsberg Kamptal Gruner Veltliner Gobelsburger, $14, Terry Theise Selections/Michael Skurnik Imports. I thought I drank all of those. What a happy surprise - I love this wine and I decided to drink it immediately. But when I extracted it from the web of wine bottles, I saw that it was only about a third full. I must have started drinking it, put it back in the fridge, and forgotten about it. CellarTracker tells me that the last time I opened a bottle of this wine was...19 days ago. Could it still be drinkable? Let me first tell you about drinking this wine under normal circumstances. You could say that it is Schloss Gobelsburger's entry level wine, a Gruner made from purchased grapes (as I learned from reader Yule's comment on a previous post). It is a delicious wine that is unmistakably Austrian Gruner Veltliner. Classic scents of lemongrass and sour cream, great balance and texture, and impressive length and complexity, never mind that it retails for under $15. I went through quite a bit of it in the late summer, and although it is immediately pleasing, it was always better on the second day. The wine becomes more detailed and there is a slightly peppery edge to the nose. It's simply a lovely wine, and a great value. But could it still be good after 18 days open? You've probably guessed by now that the wine was great, and it was. Can you believe it - 18 days in and the wine was great. Honestly, not merely drinkable, but great. Better than on day 2. So expressive and finely tuned, good energy on the finish, more than one has a right to expect in a regional Gruner Veltliner. And there it was, day 19. How can such a thing be explained? I don't have an answer for you. I can tell you that the wine is closed with a screw cap, and that wine maker Michael Moosbrugger has a great reputation. But I have nothing here, not even a guess as to how this little entry level wine shined 19 days in. If you would like to share guesses or opinions, please do. Otherwise, it's just one more wine mystery. Breaking News -- BrooklynDaughters Drink Wine! Both of my daughters have fun smelling wine in our glasses. My older daughter, almost 4 now, likes to tell me what it smells like. The younger one just does whatever her older sister does. Neither has shown any desire to actually take a sip, in fact recoiling with a smile when offered. Then the other day it happened. I had a glass of wine on the living room table and the younger daughter came up to smell it. She holds the glass when she does this, and this time, very quickly and without ceremony, she took a little sip. I was kind of shocked, and I took the glass from her and sat their quietly to see what would happen next. She is almost 2, by the way. She just stood there blinking. "Do you like it?" I asked. "Yea," she said. Well now the older daughter came running over and had to taste it too. So she took a sip, and considered it. "Wine is for grown-ups," she said. "Yes, it is for grown-ups. But do you like it?" "I like it," she smiled, and ran back to continue building with her Lego blocks. Both have smelled wine since then and show no further interest in drinking it (whew). But the older daughter did remind me that I have wine saved for her from the year she was born. Some of you might be ready to call child protective services right now, but I think this was a great way to have your first sip of wine. No pressure, no buildup, no admonishments or judgments, just pure exploration of something that makes mommy and daddy happy, and experienced in their loving company. The wine in question? 2006 Pierre Gonon St Joseph. Not a bad wine to begin with, I'd say. Now I have to add some Gonon's St Joseph to their birth year boxes. Pretty soon it's going to be all root vegetables and winter squash at the farmer's market. There are still greens, however, even if they are of the sturdy and bitter variety. One of my favorites is escarole. Escarole is a bitter green, technically a kind of endive, and in the chicory family. I've eaten escarole many times, but always passively, if served to me at a restaurant, for example. My favorite local farmer Bill Maxwell started growing escarole last year and I discovered that it's great in soups. He had escarole on Saturday, for the first time this fall, and I pounced. I wanted to do something simple with this specimen, as it is so lovely. So I finely minced a third of a garlic clove, cooked it in a little neutral oil, added a few drops of fish sauce (we're all out of anchovies), some salt, and then the escarole, which I chopped into large pieces. Add a small glug of stock, stir, stir, taste, a little more salt, and that's it. Perfect with some bread or rice as a light dinner, or as a side dish. I ate this as the main course, and then had some cheese afterward. So that's it, that's the dish. Please, you be the sommelier. What would you drink with this quickly braised escarole? Share your pairing ideas in the comments and I'll tell you what I drank and how it worked out soon after. I was very fortunate to be invited to dinner by JD Headrick, the philosophical and articulate wine importer based in North Carolina. Headrick's portfolio is small, but well selected. But if you consider only his Loire producers, his portfolio is large - 20 producers. His wines are well distributed (it seems to me, anyway), and appear in many states, but they don't appear on retail shelves as often as you might think, based on the quality of the wines. Those who know Headrick's wines always seem to like them, and you'll see his bottles appearing on the lists at top restaurants on the east and west coasts. (2000) Françoise Bedel Champagne Dis, Vin Secret, about $60. Bedel is that excellent producer working in the far west of the Vallée de la Marne, closer to Paris than to Reims. The one who converted to biodynamic farming in 1982. Pinot Meunier does very well in this area and Bedel's wines are mostly Meunier. According to Peter Liem, this is one of two terroir-specific wines Bedel makes, both from limestone parcels. I love LOVE love the other wine, called Entre Ciel et Terre, and this was my first time drinking Dis, Vin Secret. It is 100% Meunier, mostly from the ripe and forward 2000 vintage, with about 10% reserve wines. It was a beautiful wine and a great value at the suggested price. Classy on the nose with the rich and slightly oxidative aromas that typify Bedel's wines, the wine hits that balance of lushness and focus on the palate, a combination that can be elusive with Meunier wines. The fruit is sweet and red, and underlined with a cooling stoniness. Very fragrant, it really lingers on the finish. Delicious in a visceral way, this wine also offers something to think about if you're one of those folks who looks down upon Meunier-based Champagnes. We drank this as an apertif, but I wish I had saved some for my excellent plate of scallop carpaccio with sturgeon caviar and butter-toasted poppy seeds. By the way, Rouge Tomate is really good. I had previously dismissed it because the name reminded me of this rather dismal place in the Mitsuwa food court - Italian Tomato. Silly me. 2008 Michel Delhommeau Muscadet Sèvre et Maine Sur Lie Cuvée Harmonie, about $15. Delhommeau is a newer producer in Muscadet and his vines are on the black quartz called Gabbro, in the village of Monnière, right near Michel Brégeon's vineyards in Gorges. This wine was absolutely classic. Fragrant with lees-y citrus fruit and that anise seed hint that I also get in Brégeon's wines, well balanced and energetic, very mineral, and delicious with oysters. If this bottle is any indication, Delhommeau is a nice addition to the existing super-group of Muscadet producers, and if you're into Muscadet, you should find a bottle. 2008 Claude Riffault Sancerre Les Boucauds, about $28. This one took a little while to unfold and then was just lovely wine, and like the best wines from the area, much more about Sancerre than about Sauvignon Blanc. Very strong acidity and minerality anchors the fruit and the finish has a gentle creaminess to it. To me, this is not a wine for sipping before dinner. 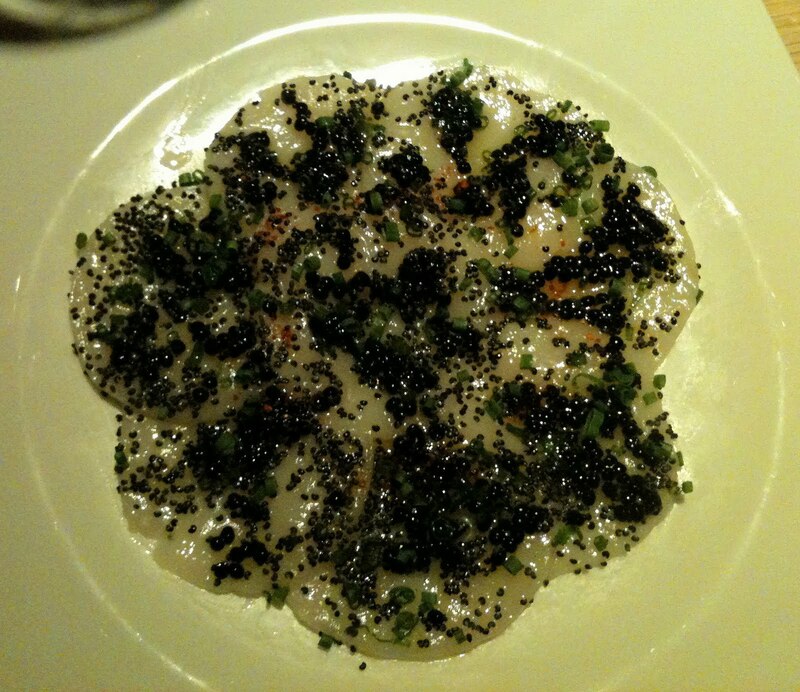 I drank it with the scallop dish and it was a very good match. It would probably be great with any kind of white fish in creamy sauce, or even lean pork dishes. 2007 Damien Laureau Savennières Les Genêts, about $28. What can I say, I love these wines. I have much more experience drinking the other cuvée, Bel Ouvrage, which is aged mostly in barrel. Les Genêts is aged mostly in tank, and the 2007 it is such a fine wine. Can I take a minute here and say that I LOVE 2007 in the Loire? This wine is floral and powdery on the nose, and continued to gain in complexity until we drank it all. Such vibrancy in the mouth, the wine really fills all cavities, and this is a lean wine we're talking about, it's not accomplishing this with excess, but rather with energy and grace. No question for me at this point, Laureau is my desert island Savennières. There are other wines that I truly liked on that evening - two different Cour-Cheverny by Domaine des Huards, for example. The 2002 took a while to open up, very oxidative at first, but after about an hour it found a balanced and delicious place. The 2008 was all young craggly rocks, and you could drink it with oysters and then scrape the mud off a pig with whatever is left in the bottle. 2007 Claux Delorme Valençay, about $16, is a delicious blend of Malbec, Gamay, Cabernet Franc, and Pinot Noir. Lighter in body than the 2006, it continues to impress me as a full bodied wine that is fit for richer meaty dishes, and yet has a light enough mouth feel to be very good to drink on its own. If I owned a restaurant I would serve this by the glass so fast, your head would spin. Every one of these are wines that I would eagerly buy for myself, or order off of a restaurant wine list. Okay, maybe not the Sancerre, but that's about me and my issues with pricing in Sancerre, not about this particular wine. I'm telling you, people - JD Headrick has good wines. If you like good wine, you should keep your eyes peeled. A few weeks ago a sample box containing two bottles of wine showed up at my house. I never have high hopes when opening these things, but this one contained quite a treat - a bottle of 2008 Dönnhoff Oberhäuser Brücke Riesling Spätlese, about $50, Terry Theise Selections. It wasn't Theise or Skurnik who sent the samples, it was a group called Destination Riesling (and I originally mis-identified them as Rieslings of Europe). I don't have a lot of experience drinking German Riesling, and if I were going to buy a Dönnhoff wine to experiment with, I would begin by reading a bit - perhaps Lyle's blog. And I definitely would have started with something a lot less expensive. Heck, I don't even know the Dönnhoff line-up, and whether or not this is one of the top sites. So I called my Riesling lovin' pal Dan Melia and he told me that this is indeed one of Dönnhoff's top wines, and that this particular bottle, the 2008, was actually his favorite wine during a recent visit to the Dönnhoff estate. Nice! I should tuck this away for a decade or more and one day it will be brilliant. But wait a minute...Wouldn't that be kind of silly, in this case? First of all, it is a sample, and meant for me to drink in the near term, not a decade from now. Also, if I don't understand the wine when it's young, what will I gain from drinking it when it's more mature, or "better" than it is now? There would be nothing to compare it to. So I decided to drink the wine, and the only question was when. And then on a recent evening, without a whole lot in the fridge, I made a simple dinner that is a monthly staple in our house - firm tofu with celery, carrot, and onion in fiery hot chili and fermented soybean sauce. We had no beer, which is probably best with this dish. But we did have a great young bottle of Spätlese Riesling. What can I say - the wine was absolutely delicious. Such clarity, such a harmonious package of aromas and flavors. And although there have to be 80 grams of residual sugar here, and the alcohol is only 8.5%, this wine drinks as though it is dry. What I mean is that the sensation is not one of sweetness, although it is a sweet wine. It is balanced perfectly by acidity and feels lush and ripe, energetic. And I loved how on day 2 the wine showed a complex brown baking spices and earthy tone. Neil, let me begin by saying how much I like that shirt you're wearing. Now, about Riesling...I think that you sacrifice less when you drink Riesling young than you do with any other grape. Of course good Riesling changes a lot as it ages - the fruit recedes a bit, the sweetness recedes a bit, the specific mineral and soil character becomes more prominent. But good Riesling is delicious young, and there's nothing wrong with drinking it that way. It's not like a lot of other wines that can be closed or hard when young. It's a personal preference thing. There is no best time to drink good Riesling, and I hesitate to answer when people ask me to tell them the prime drinking window for a certain wine. It really depends on how you like your Riesling. I would be tempted to dismiss this as typical wine business clap-trap that urges me to drink wine quickly, so then I of course have to buy more wine. But Dan bears no resemblance to the people who adopt that strategy in answering wine questions. This was his thoughtful response, before I drank the wine, when I asked him when I should drink it. It's an interesting idea - Riesling as great wine for young drinking in terms of minimal sacrifice. Are the Beaujolais '05's Ready Yet? --A bottle of Desvignes Morgon Javernières, "Upper Tier," $22, Louis/Dressner Selections way back in late January was a lot less closed than I expected, showing great depth of fruit and earth, and seemed to me that it would become something great in time. --A bottle of Diochon Moulin-à-Vent Vieilles Vignes, $20, Imported by Kermit Lynch Wine Merchant back in late March was unresolved and lacking in clarity, almost muddy. I had this wine several years ago and it was great then, so I have to assume that we caught this one in a closed and weird phase. Anyway, I'd been itching to check in on the 2005's. One day last weekend I put together a lunch that seemed right, and so into the "cellar" I dug. 2005 Michel Tête Juliénas Domaine du Clos du Fief "Cuvee Prestige," $23, Louis/Dressner Imports. I've probably had a half a case of this wine, but none in the past couple years. The last bottle I drank sometime in early 2008 was raspy and harsh, closed. This bottle was really great and although the wine clearly can continue to age (and probably improve), based on this bottle, I think the wine is ready. The fruit character is soft, without the vivid brightness of youth, but it is equally charming and delicious. Like stewed strawberries as opposed to freshly picked. On the nose there are subtle gamy and earthy notes. It is a soft and alluring nose, very fine. The wine shows very mineral on the palate, with a layer of iron upon which the meaty fruit rests. It is very well balanced and structured, although the tannins are much rounder and softer than they were a couple of years ago. Especially if you have multiple bottles, I think this is worth checking in on - it's drinking very well. What was the lunch that inspired me finally to crack open another '05 (I have only a mixed half-case in total, you see)? Nothing at all complicated. A kale salad dressed with a very little bit of anchovy mashed into some olive oil and a bit of grated Parmesan cheese. And cauliflower sautéed in brown butter with caraway seeds. Thinking about the iron-y flavor of the kale made me think of Beaujolais - the mineral character of wines from Moulin-à-Vent, Fleurie, and Juliénas often reminds me of iron. And so, what about you? Checked in on any of the 2005's recently? Any news to share? Whenever I feel tempted to make fun of the pizza explosion of recent years, I remember this: it's okay that pizza is just bread, tomato sauce, cheese, and perhaps a few toppings. There can be honor and wisdom in pursuing very simple things, focusing on the fine points of technique and detail. I get it. There certainly are other things I love that are very simple, and yet highly agonized over. Ramen, for example, is just noodles and broth with a few toppings. Ice cream is just cream, milk, eggs, and whatever you want to flavor it with. I could keep going here. The thing is, my favorite way to eat pizza just doesn't overlap with the places that seem to be popular now. This is my opinion only - I'm simply sharing what I like and don't like, so don't start hating on me in the comments because I'm not into Motorino, Franny's, or Lucali. I've eaten pizza at each of those places, and at some of the other modern temples of NYC pizza, and the food can be very good. Lucali's pizza with fresh artichoke - seriously delicious! Motorino's pizza with Prosciutto di Parma - awesome! My issue here isn't with the actual pizza. I'm not the guy to make profound statements about pizza anyway. Dr. Parzen is better suited to moderate such a discussion. That guy has eaten pizza on 5 continents and can tell you where to go in Benin, Bucharest, Bologna, or Brooklyn for the best slice. This is not about the finest pizza, but instead it's about the way that I love to eat pizza. Bottom line - I want the food to be delicious. But I want a homey atmosphere without even the slightest whiff of hipster. I want to sit in a booth with a few people, hopefully my kids included. I want that moment of terror as the server says "Coors, Coors lite, Bud, Bud lite, Becks," and then that feeling of relief when they say "Peroni, or Moretti." I want to choose from appetizers like broccoli rabe, stuffed mushrooms or clams, or cold antipasto. I want a great pizza that feeds 4 adults to cost something like $16. I want the servers to be related to the lady who greets me at the door, who in turn is married to the guy making the pizza. Okay, I'm willing to be flexible on that last one. I guess what I'm saying is that Lucali and the others for me will always be about going to Lucali, not about going for pizza. 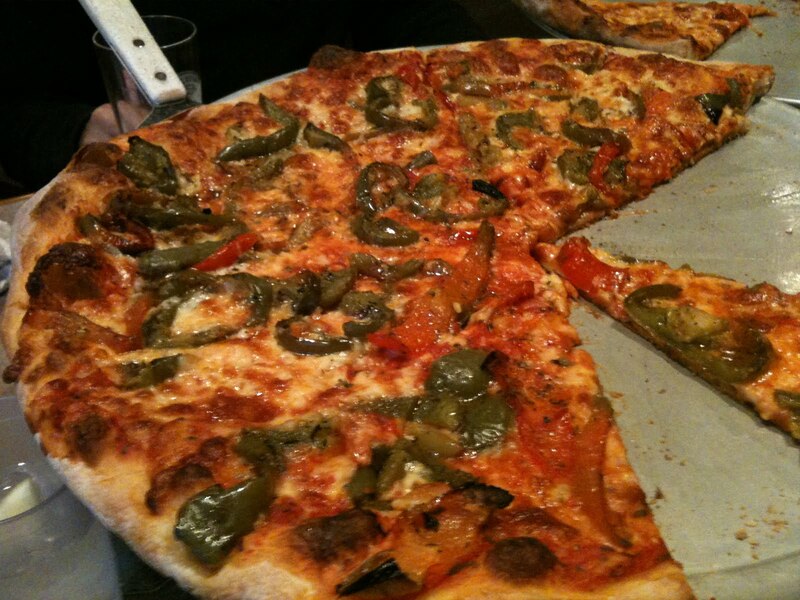 For me, the best way to go for pizza is at a place like Anthony's Restaurant in Torrington, Connecticut. I would link to it, but the place has no website. New Haven isn't the only part of Connecticut with great pizza. Italians settled all over Connecticut, and the factory towns of the northwest each have a few cozy little Italian restaurants. I wouldn't order the shrimp scampi at Anthony's, or at any of these places. But the grinders are great (peppers and eggs...yum), and so is the pizza. And to me, it's the best way to eat pizza. Totally low key Italian joint with a boatload of regulars, and no pretense whatsoever. That pizza in the above photo, that was from Friday night, when BrooklynLady and I took the kids to visit family in the Torrington area. We always go to Anthony's when we visit, and our order was pretty typical. A round of Peroni on draft, starters of broccoli and escarole (both drenched in garlic and butter), and two pies. One plain, and one with green and red peppers. They roast them perfectly, and the smokey sweet pepper and its slightly bitter skin work so well with the tomato and savory cheeses. If you think this is some sort of romanticizing of small town pizza joint, you're right. But don't be fooled - I'd put the actual pizza at Anthony's up against whatever you get at Lucali, Roberta's, Keste, or whatever else you want to talk about (Di Fara's, maybe not). Seriously - the pizza is awesome. It's a different setting though, and one that I prefer. In the way that the general wine drinking public under-values Loire red wines, I think that us Loire lovers under-value the wines of Domaine Filliatreau. In Saumur-Chamigny, it's easy to pay attention to the great wines of Clos Rougeard and to ignore everyone else. My favorite producer in Saumur-Champgny, outside of Clos Rougeard, is Domaine Filliatreau. The wines deliciously express terroir and are modestly priced. Filliatreau's is a large estate and there are many wines produced. Not all of these wines make it to the US, and those that do make it here are not widely available. They are worth looking for, though, particularly the two top wines, Grand Vignolle and Saumur-Champigny Vieille Vignes. And it is these two that I very rarely see, at least in the retail shops that I frequent. I love the Vieille Vignes, but the last vintage that I've seen here is 2005 -that was two years ago. I drank a lot of 2005 Grand Vignolle, didn't love the 2006, never saw the 2007, and liked the 2008 a year ago at a Dressner tasting. I haven't seen Grand Vignolle on retail shelves in almost 2 years, but I am happy to tell you that Chambers Street is selling the 2007 right now, and the wine is in New Jersey too - who knows where else. If you like Cabernet Franc from the Loire and you haven't tried this wine, you honestly should make a point of buying this. I promise you, you will not be disappointed. If you are, email me and I'll send you a check*. La Grand Vignolle is a large set of vineyards that runs alongside the Loire River in Saumur-Champigny. The vineyards are on a large hill of Tuffeau and other rock, and there are caves, and even houses built right into the stone. The vines for this wine are about 40 years old and the wine is typically intense and expressive without being too weighty. 2007 Domaine Filliatreau Saumur-Champigny La Grand Vignolle, $18, Louis/Dressner Imports. This is great wine! Right out of the wine fridge, it is all about cool dark fruit flavors and floral aromatics. As the wine warms, the iron and metal minerality takes over the bass line and the nose begins to show graphite and tobacco tones. Perfectly balanced and completely delicious, there is no shame in drinking this all up now. But the quiet old vine intensity, the substance that emerges in the mid-palate, the strong acidity...these things make me determined to put a couple bottles away for a few years. *By "check," I mean a note of apology. Went with a friend and also my 3 and a half year old daughter to the Hokkaido Food Fair at Mitsuwa, the large Japanese market in Edgewater New Jersey. We had to battle for a parking spot and it was very crowded inside. There were all sorts of delicious looking things for sale, but sadly, most of these things were not available in small portions for sampling. I was tempted by plump looking Alaskan King Crab sushi, but the line was long and it was only available in $40 portions. 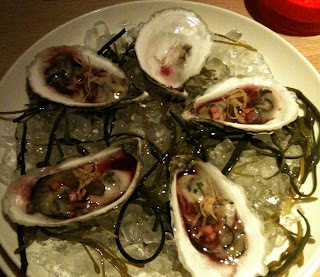 The crab and asparagus croquettes, and all of the croquettes in fact, looked fantastic. But the line was approximately one city block long. So we took a number at the Shingen Ramen stall and ordered KokuMiso Ramen, black miso ramen whose broth is reputed to simmer for over 100 hours, not dissimilar in length to the time we waited to receive our bowls. This place was crowded! Shall I tell you about the complicated test of strategy that involved securing a place to sit? Another time. Well worth the wait, as it turns out. The ramen was delicious - yellow curly noodles were pleasantly chewy and the scallions, bamboo shoots, and pork toppings were good. It was the broth, however, that made this a great bowl. deeply flavored, impossible savory, and not at all heavy. After eating our ramen we walked through the aisles of Mitsuwa, happily licking green tea soft serve ice cream. Troughs of squid, the most perfect burdock root I've ever seen, at least 50 different miso pastes (I bought Shiro and also a thick red country miso). We saw bottles of Japanese white, a 1997 Koshu, perhaps the current release. At something like $35, I wasn't tempted. If you live in the NYC area and you're not going to make it to Japan any time soon, you could do worse than to take a trip to Mitsuwa.